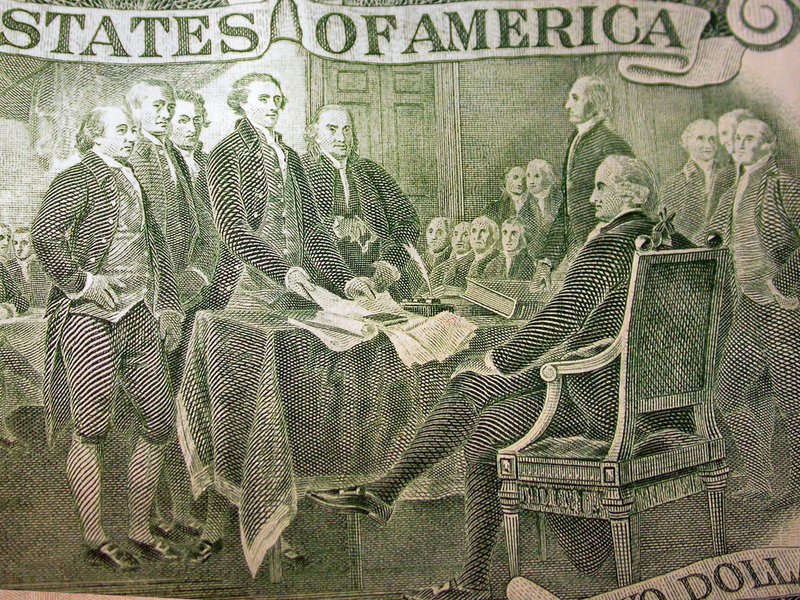 On this day in history, 1774, the first Continental Congress convened. At Carpenter’s Hall in Philadelphia, the Continental Congress met for the first time to address the British Parliament’s enactment of the Coercive Acts, a legislative measure intended to quell rebellion in Massachusetts and teach those Bostonians a lesson for that whole Tea Party debacle. 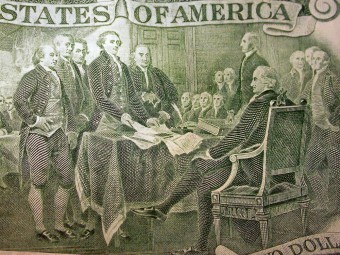 Delegates from all 13 colonies (except Georgia), including George Washington, Patrick Henry and John Adams, elected Peyton Randolph from the state of Virginia as the first President of Congress, and together they drafted a declaration of rights and grievances. The British first began to push their luck with their colonial subjects with the passage of the Stamp Act in 1765, a heavy tax imposed with the purpose of raising revenue to support British troops in the colonies. Americans thought this rather unfair, and in October 1765 with “no taxation without representation” as their battle cry, the colonists convened the Stamp Act Congress to make their opposition perfectly clear. When the Stamp Act went into effect that November, many colonists immediately boycotted British imports, and attacks were staged on customhouses and tax collectors’ residences. Parliament finally voted to repeal the Stamp Act in March 1766 after months of anti-British protest in America. Stamp Act notwithstanding, most colonists still passively accepted British rule as the natural order of things, and would have been shocked at the idea of considering themselves anything other than subjects of His Majesty King George III. Then Parliament passed the Tea Act in 1773, and people really got heated. You just don’t mess with Anglo-Saxons and their tea, no matter what side of the pond they’re on! The Tea Act was a bill that gave the flailing British East India Tea Company a monopoly on the American market by drastically lowering its tea tax. This meant the company could even undersell Dutch traders illegally trafficking tea into the colonies, and many Americans viewed this as just another example of British arrogance and tyranny. This bill was the inspiration for irate Patriots in Boston to defiantly dump 18,000 pounds worth – about $1 million today – of British tea into Boston Harbor. Parliament, of course, could not let their provincial, shabby colonists get away with such bellicose behavior and enacted the aforementioned Coercive Acts, which were angrily referred to by the locals as the Intolerable Acts. And intolerable it must have been, with Massachusetts under harsh military rule and merchant ships forbidden to unload at Boston Harbor, causing much deprivation among the people. In all the colonies, representatives of the British government could not be prosecuted for any crime, and colonists were forced to shelter British troops. These are the circumstances that led to the First Continental Congress, rendering serious discussion as to whether the colonies should consider a united American resistance to perceived British tyranny and oppression a wise tactical move. Even though there were many bumps and hiccups during the weeks of the Congress, it was the first time that the colonies attempted to work together as a cohesive unit, instead of as decidedly separate entities.